If you’d like to scuba dive with confidence at depths down to 40 metres/130 feet, you should take the PADI Deep Diver Specialty course with me today. If you’ve earned the PADI Adventure Diver rating or higher, and you’re at least 15 years old, you can enroll in the Deep Diver course. Your training starts by reviewing reasons for deep diving and how important it is to know your personal limits. During four deep dives over the course of at least two days you’ll go over specialized deep diving equipment, deep dive planning, buddy contact procedures, buoyancy control, gas supply management, dealing with gas narcosis, and other safety considerations. The first dive of this PADI Specialty Diver course may credit as an Adventure Dive toward your Advanced Open Water Diver certification. A Deep Diver Specialty certification may be credited toward Skill 5 (Deep Dive Scenario) in the Divemaster Course. 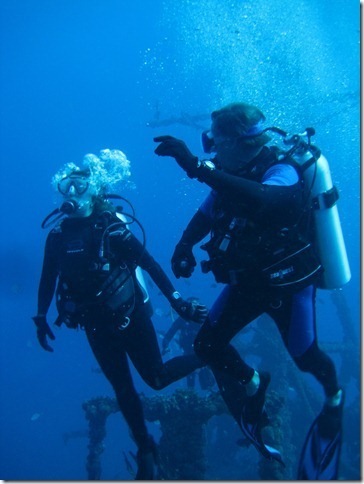 Contact me to obtain the PADI Deep Diver Crew-Pak that includes your manual and video. You’ll need a dive computer along with the rest of your basic scuba equipment, to include appropriate exposure protection (e.g. wetsuit or dive skin). A dive light and slate are also recommended.